Nancy S. Heininger, 93, of Granville passed away peacefully Wednesday, December 5, 2018 at her home surrounded by family. She was born in Spencerville, OH to the late Charles Thomas and Jenny Fay Sutton. Nancy earned her registered nurse credentials from Lima Memorial Hospital Nursing School and worked with Head Start, Ohio Veterans Children’s Home, and served at other various care facilities. She later attended BGSU receiving a History degree with a minor in English. Faith, family, and music were the core of Nancy’s being. A pastor’s wife for over 67 years, she was a woman of great strength and love, committed to serving, caring, and giving to others. She was a past member of Vintage Voices, Singing Minister Wives, and Eastern Star. 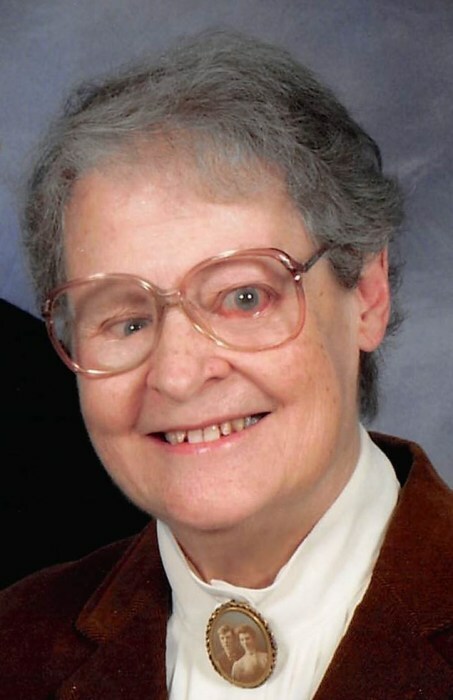 Nancy enjoyed sewing, cooking, refinishing wood furniture, working crossword puzzles, playing board and card games, and mostly, being the “best of buds” to her grandchildren. Very sweet in nature, yet practical, she will be remembered for her saying, “Waste not, want not”. Surviving are her sons and daughter-in law, James Heininger of Johnstown, and Andrew (Marie) Heininger of Bellville; daughters and son-in-law, Amy Lu Heininger of Garwood, TX, and Julie (Jeff) German of Granville; grandchildren, Nathanael, Gordon, Samuel, Katherine, Carol, Sarah, and Abigail; and one great-granddaughter, Hazel. In addition to her parents, she is preceded in death by her husband, Rev. James Heininger, who died April 26, 2015; brothers, Wayne, Paul, and Joe; and twin sister, Amarilla Finley. The family will receive friends Sunday, December 9, 2018 from 2 to 4 P.M. at the McPeek-Hoekstra Funeral Home, 133 S. Prospect St., Granville. A memorial service celebrating her life will be held the following Sunday, Dec. 16 at 3:00 P.M. at Centenary United Methodist Church, 102 E. Broadway, in Granville with Rev. Casey Wilson as celebrant. A graveside service will be held at 11:30 A.M. on Thursday, Dec. 13, 2018 at Maplewood Cemetery near Spencerville. Memorial contributions may be made to Meals on Wheels, c/o Centenary United Methodist Church or Hospice of Central Ohio Foundation, P.O. Box 430, Newark, OH 43058.